Hearty Roots Community Farm was started by the Shutes in 2004 and grows food for over 500 families. Over the past nine seasons, the farm has expanded from 1/4 acre to 95 acres with 25 acres in vegetable production. Finding affordable land for the farm’s permanent home was a challenge, and Ben Shute has become a strong voice for increasing land access for farmers throughout the Hudson Valley. The National Young Farmers Coalition (NYFC), currently led by Lindsey Shute, was founded in 2009 to “represent, mobilize and engage young farmers across the country to ensure their success.” The Coalition now has over 450 members across all 50 states and has become a strong advocate for policy changes at the national level that will better sustain young farmers. It provides practical resources for young farmers and Farm Hack (which was incubated by NYFC) connects farmers with other farmers, engineers, designers, architects and other allies through in-person events on farms, in grange halls, and through an on-line forum. Prior winners of Glynwood’s Harvest Award include Hudson Valley Fresh, a not-for-profit dairy cooperative; Farm to Table Co-Packers, a full service contract packaging facility in Kingston (Ulster County, NY) that produces everything from frozen vegetables and soups to jarred pickles and sauces; the Northeast Livestock Processing Service Company, a grassroots business, created by livestock farmers to help other farmers overcome processing and marketing challenges; and Wild Hive Farm, which “promotes sustainable agriculture through grain based local agriculture” and stone mills flours at its mill in Clinton Corners (Dutchess County, NY). Wild Hive Farm at one time operated a wonderful café in Dutchess County, NY, with the best grilled cheese sandwich this writer has ever eaten. Sadly, the café was shuttered, so Wild Hive Farm could focus more intensely on its farming operations. Other locavore prizes were awarded last month, at the 173rd annual Columbia County Fair in Chatham, NY (a small town in the upper Hudson Valley). The fourth annual Victoria A. Simons Locavore Awards were presented to three co-winners, Josephine Proul, the chef of the superb farm to table restaurant, Local 111, in Philmont (Columbia County, NY) which this writer has enjoyed on numerous occasions; Hawthorne Valley Association, recognized for its multiple activities focused on local agriculture and the operation of a 400 acre biodynamic farm (which includes a 300 member CSA); and Staron’s Farm & Market., the Staron family has operated a popular farmstand where they have sold vegetables and flowers grown on their family farm for 35 years. These locavore awards were established in memory of Victoria A. Simons, the long time editor of The Independent News, who was also the first executive director of Columbia County Bounty (which inspired the creation of Hudson Valley Bounty) and the first woman to serve on the board of the annual Columbia County Fair. A global perspective on locavore heroes is seen in the naming of Carlo Petrini, the founder of Terra Madre and the Slow Food movement, as A Champion of the Earth by the United Nations Environment Programme (UNEP). The Slow Food movement has grown to cover a network of over 100,000 supporters in over 150 countries. At a ceremony held in the American Museum of Natural History in New York City, UNEP’s Executive Director, Achim Steiner observed that the Slow Food Movement has become a formidable force that defends local food traditions, protects local biodiversity, and promotes small-scale quality products. Over 10,000 small producers are involved in Slow Food Presidio projects which support small-scale artisinal and traditional food products. Slow Food’s inspirational project, “A 1000 Gardens in Africa,” involves the creation of school and community gardens in Africa. With a donation of approximately US$1200, a donor can “adopt a garden and twin with one of the African communities involved in the project.” Might there be successful CSA farms in the U.S. and Canada financially able to consider this way to support sustainable agriculture in Africa? 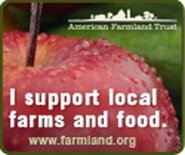 Valuing local agriculture and becoming a part of a CSA farm community does not represent a lack of caring about developing sustainable food sources around the world. We all share one planet. Growing “good, clean, and fair food,” in Carlo Petrini’s beautiful words, “enables us to earn value in terms of conviviality, personal gratification, community service, environmental protection, and in a word, well-being.” Kudos to all the award recipients- local and distant.